I hope you brought your pillow because we’re about to dive right into the middle of another mattress battle! This week, the all mighty Purple mattress is going head-to-head with the well known, GhostBed. Both of these mattresses have quickly made a name for themselves in the online industry, but does one have enough power to knock down the other? Continue reading below to discover who will take the championship belt home this week! Wanting to get right to the point? Click here for the summarized breakdown of this week’s mattress battle. The Purple mattress is built from a combination of foam and polymer and totals 9.5″ in height. Top layer (cooling & comfort) – 2″ of hyper-elastic polymer. This top layer of hyper-elastic polymer is designed to provide the cooling, bounce, and pressure relief for the mattress. Middle layer (support) – 3.5″ of polyurethane foam. This layer is placed directly below the polymer layer in order to provide great support and deep compression support for sleepers. Bottom layer (foundation) – 4″ of polyurethane foam. The bottom layer provides the deep compression support for the sleeper as well as the foundational support for the mattress. The cover of the Purple mattress is crafted from a blend of viscose (27%), polyester (69%), and polyester-lycra (4%). The combination of these materials makes for a great level of elasticity as well as breathability. Thin by design, the cover allows for consistent levels of airflow in and out of the mattress. Aesthetically speaking, the cover of the Purple is also quite nice. While it does use an all white color scheme, the diamond pattern spread across the cover as well as the embossed Purple logo gives the cover a more fashionable appeal. Overall, the cover of the Purple contains a solid build quality, has a pleasing appeal, and does a great job of providing airflow for the foam layers below. The Purple lands between a 6-6.5 out of 10 on the firmness scale, where 10 is the most firm. 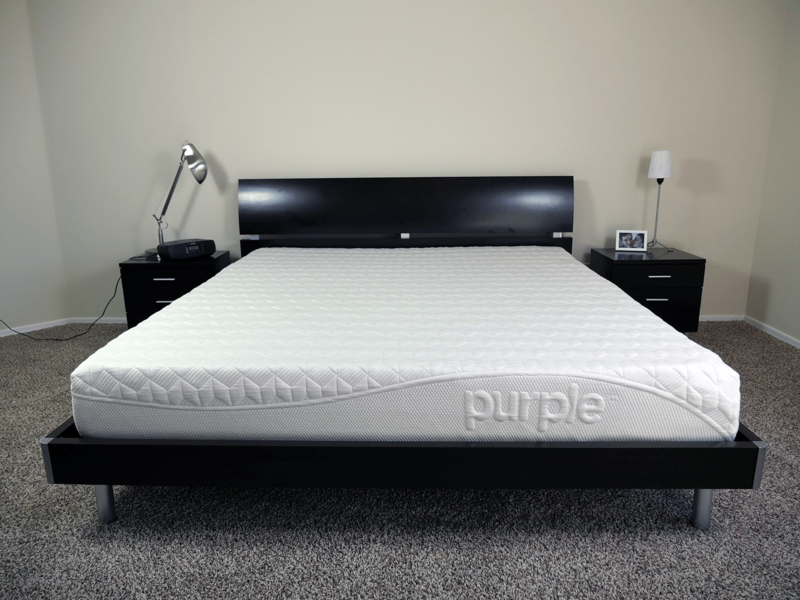 Purple’s main goal with this mattress was to create a firmness level suitable for most sleepers. Built with a 2″ top layer of hyper-elastic polymer, it’s safe to say the Purple embodies a feel unlike any other mattress I have tested. The polymer acts like latex in many respects, but seems to do everything a tad bit better. Bounce, cooling, pressure relief, and response are the main areas that the Purple’s polymer compares very closely to latex. That said, sinkage on the Purple is a bit more complex. For sleepers around 150 pounds, there is a relatively minimal level of sinkage and hug. If you are a sleeper less than 130 pounds, there is a more of a floating feeling. As we get past 150 pounds to the more average weight and heavier sleepers, there is most certainly a more noticeable level if sinkage, bringing the feel of this mattress closer to a 6 out of 10 on the firmness scale. For those lighter sleepers experiencing that floating feeling, the Purple is going to feel closer to a 6.5 out of 10. Purple’s contour is less dramatic, it has more of a rounded and balanced hug / contour. 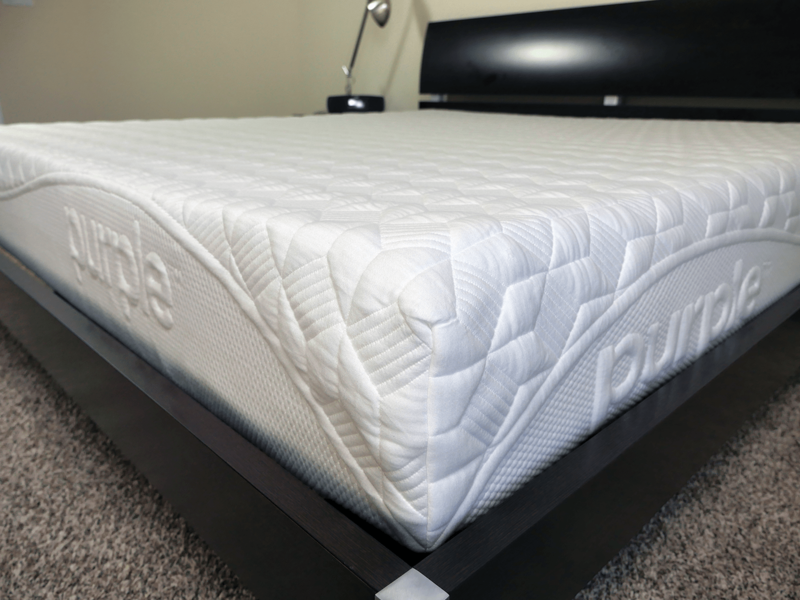 The construction of this mattress gives it a high degree of point elasticity, allowing more body parts to sink in and receive the support / pressure relief they need without changing the overall feel of the mattress. Purple’s polymer is similar in some respects to latex foam, especially regarding the degree of contouring hug. Purple is capable of supporting up to 300 pounds per side. Last but not least, cooling. Overall, Purple’s cooling properties are hard to beat. Thus far, I would say Purple is one if the coolest mattresses I have tested to date. 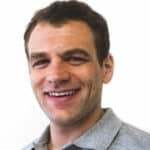 The hyper-elastic polymer smart grid design allows for high levels of airflow in and out of the mattress as well as top notch breathability from the foam layers below. 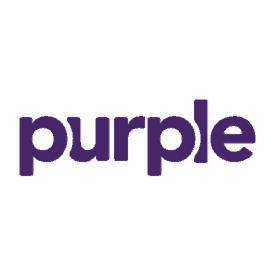 Read the full Purple mattress review here. The GhostBed is an 11″ mattress built from a combination of latex and memory foam. Slightly different than most foam mattresses, the GhostBed adds an extra 0.5″ to their comfort layer, giving these layers a total height of 3.5″. 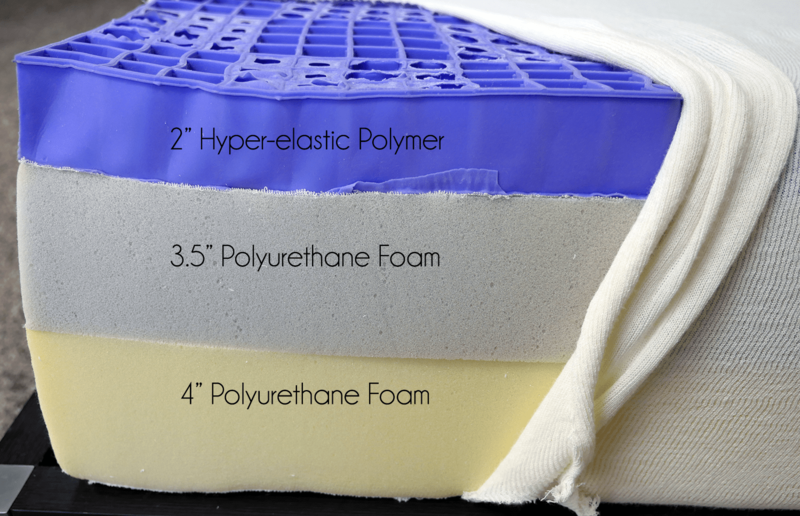 Top layer (cooling & comfort) – 1.5″ of aerated latex foam. Similar to Purple, this top layer is designed to provide a high level of pressure relief as well as the cooling and bounce for the sleeper. Middle layer (support) – 2″ of gel memory foam. 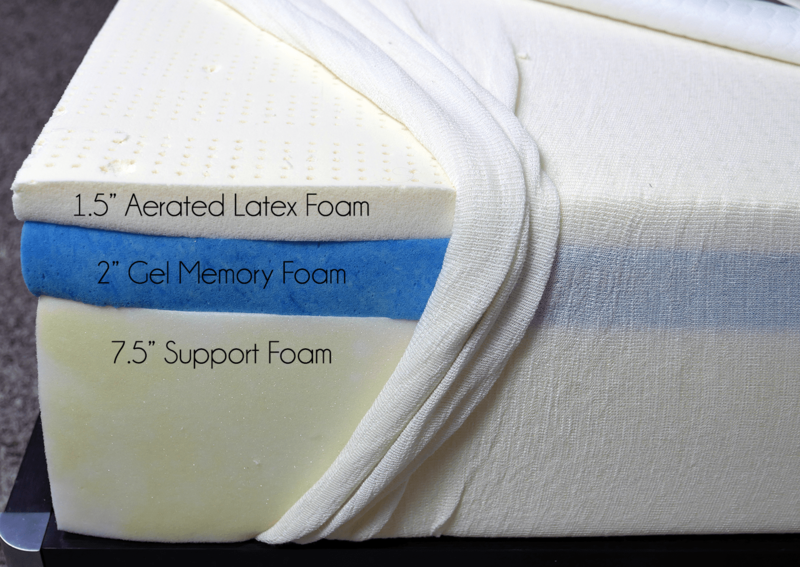 As a less responsive layer, the gel memory foam has been placed below the top layer of latex in order to provide the sleeper with more support and pressure relief. Additionally, it provides deep compression support for sleepers. Bottom layer (foundation) – 7.5″ of support foam. The bottom layer simply acts as the foundational base for the mattress as a whole. The cover of the GhostBed contains a few different materials. The white fabric on top is made from 100% polyester, while the grey side panels are built from a blend of polyester (51%) and polypropylene (49%). On top, the white fabric is stretchy, soft, and smooth. The polyester design also helps to improve breathability. As we move down the cover, the grey side panels contain a much sturdier frame. This idea was implanted in order to provide protection for the mattress as well as a sleek finish from top to bottom. The sides are not as stretchy as the top piece, but they do an excellent job of holding the top fabric down, giving the cover a tight, sleek look all around. Although GhostBed adopted the two-tone grey / white design that has become a staple of the online mattress industry, they did so extremely well. Their color transfer from top to bottom is well done and truly rounds out the mattress as a whole. Some companies do not take pride in their cover, but GhostBed is certainly not one of those companies. It may be simple, but it is definitely not low quality. 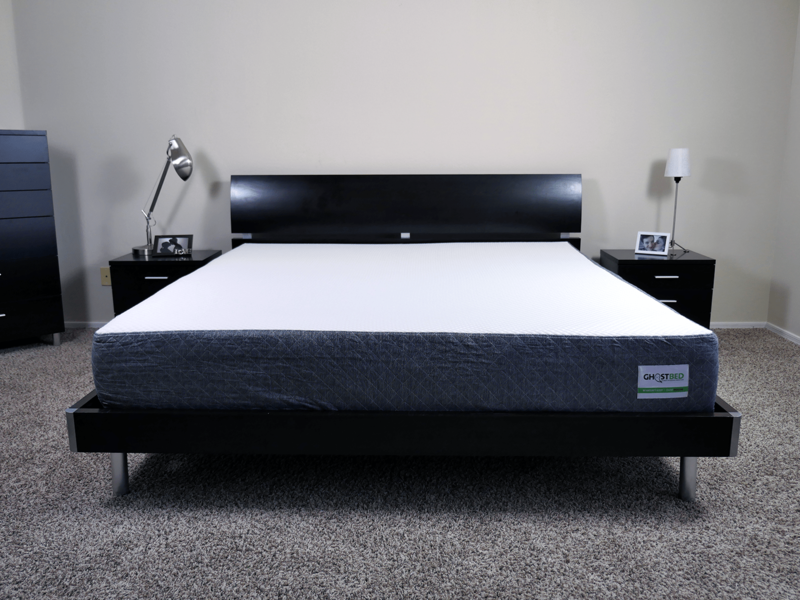 Similar to Purple, the GhostBed comes in at a 6.5 out of 10 on the firmness scale (10 being the most firm). Once again, GhostBed wanted to create a mattress with intentions of meeting the needs of a vast majority of sleepers. The GhostBed is slightly different than most mattresses I have tested. As you first lie down on the mattress, it tends to feel closer to a 7 out of 10 on the firmness scale. After a few seconds of lying on the mattress it softened up about half a point and was able to remain at that firmness level from there on out. Additionally, this mattress does a great job of creating balanced level of comfort, support, and response time, thanks to the combination of latex and memory foam. Now, GhostBed’s method of using latex as their top layer tremendously improves response time as well as bounce. Typically, foam mattresses can struggle with regards to bounce or response time, but the GhostBed has taken this notion and put it to sleep. The memory foam layers below the latex do a great job of contouring to your body once you have given the mattress a few minutes to adjust to your weight. These foams are slower to respond, meaning once they adapt to the shape of your body, you will continue to receive high levels of support and body-contour. 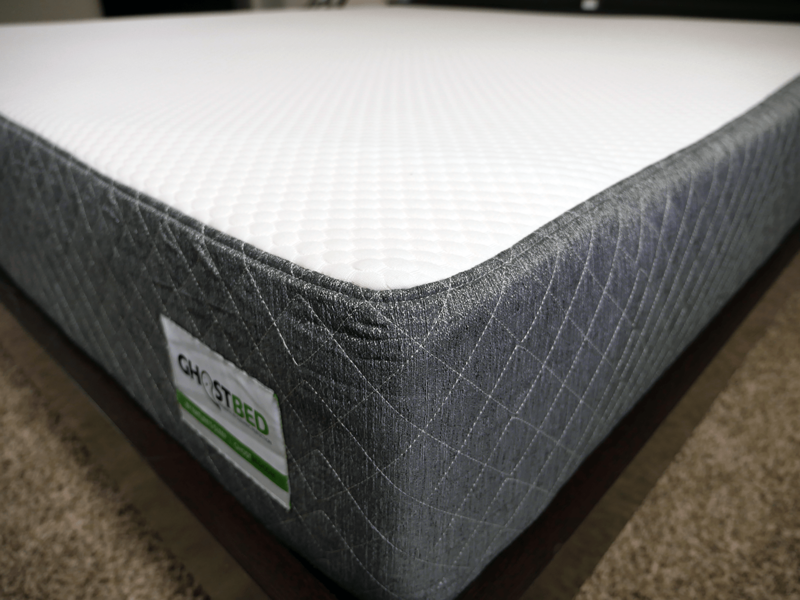 When it comes to support, the GhostBed is pretty solid, especially for an 11″ mattress. This mattress did an excellent job of maintaining a high level of support. Ghostbed is capable of supporting up to 400 pounds per side. In addition, the GhostBed did a great job relieving pressure points my body tried to create with the mattress. Each sleeping position felt well supported and spine alignment was not an issue while sleeping on the GhostBed. Finally, cooling. While it may not sleep quite as cool as the Purple mattress, it does still do a great job compared the wider universe of mattresses. The combination of 1.5″ of aerated latex foam and 2″ of gel memory foam makes for solid levels of heat dissipation. Not once did I feel as if the GhostBed was holding my body heat during my sleep test. Should I buy the Purple or GhostBed mattress? This is the part we’ve all been waiting for…which mattress should you buy, Purple or GhostBed? This is not an easy question to tackle. After several months of sleeping on each mattress, I have to conclude that this battle is a draw. Purple and GhostBed have feels that are quite different to each other. These differences will likely make one a little better than the other based on your needs, desires, and weight. For my body and preferences I lean a bit more towards the Purple, as I prefer the slightly softer feel. The below breakdowns can help you determine if Purple or Ghostbed is the better choice for you. Want a medium firm feel – the Purple mattress comes in at a 6-6.5 out of 10 on the firmness scale (10 being the most firm). If you’re more than 150 pounds the Purple is closer to a 6. If you’re less than 150 it’ll be closer to a 6.5. Want a very cool mattress – Purple’s design makes for one of the coolest mattresses to date. The combination of a hyper-elastic polymer top layer and a thin cover allows for optimal breathability and airflow. Want quick response time – once again, the polymer top layer allows for a much faster response time than your traditional foams. Latex is not far behind Purple’s polymer layer, but the gel polymer is faster. If you’re looking for the absolute fastest response time the Purple is hard to beat. Want a unique feel – the smart grid polymer top layer used in the Purple makes for one of the most unique mattresses I have tested thus far. The polymer resembles a feel similar to latex, but tends to perform at a higher level in terms of bounce, cooling, and pressure relief. Enjoy a medium to slightly firmer mattress – upon initial contact, the GhostBed feels like a 7 out of 10 on the firmness scale (10 being the most firm). After lying on it for just a few seconds, the GhostBed softens up and ends up closer to a 6.5 out of 10 on the firmness scale. The Ghostbed has a more consistent feel for different body types / weights. Want a latex + memory foam mattress – the top layer of latex provides a great level of bounce, response, and comfort. Yet, the memory foam layers below still allow for a certain degree of classic memory foam contouring. This combination gives the GhostBed both a responsive and contoured hug feel. Want 100% foam design – the GhostBed design is 3 different layers of all foam. This gives it a more classic latex / memory foam feel. 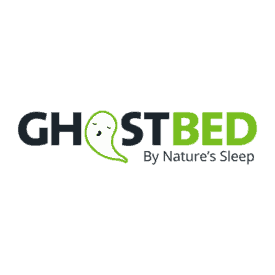 Want to save money – at $700 (with discounts applied) the GhostBed is $300 cheaper for the Queen size. That really is an amazingly good price point for a mattress of this level of quality and performance.